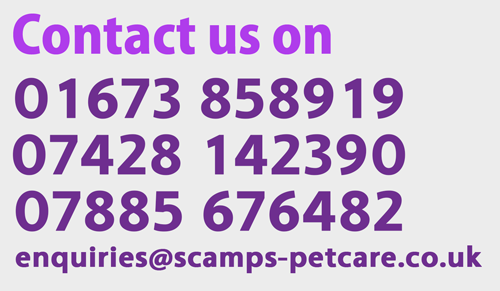 Welcome to Scamps Petcare, I offer personal, professional, safe and secure in-home care for your dogs, cats, birds, rabbits, chickens, hamsters, fish, reptiles or your menagerie in West Barkwith and the surrounding areas. I provide dog walking, puppy visits, cat & small animal sitting and over-night house sitting services. Scamps Petcare is run by an experienced animal carer Gemma, who is CRB police checked, fully insured, Pet First Aider and a member of NARPS UK. My aim is to provide you and your pets with the best possible bespoke service customised to your individual needs. I realise how valuable your pets are and that you need reassurance that they are receiving the love and attention that you would give them yourself whilst in my care. I aim to provide you with happy & healthy pets upon your arrival home. Initial Consultation: At your free meet and greet appointment I will ascertain as much information as I can about your particular pet(s). This will help ensure that I can provide the best possible care during your absence.